We have had a fantastic day of fun and adventure at Little Pips Chippenham today. 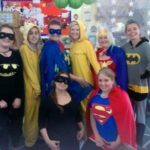 The staff and children dressed up as superheroes for the day. The children were amazing and as you can see, the ladies got very much into the theme with some even making their own costumes!…well done to everyone for a fabulously fun day!